Mansarovar, the enchanted, ethereal lake, may figure on many a bucket list. But going there on bicycles…? It was a wild idea, meticulously planned, that went ‘flat’ from day one! In this engaging travelogue chronicled by a chatty bicycle, nine cycles are ridden, helter-skelter to this amazing destination, supported ably by a junk-food gobbling, gossiping and giggling bunch of five. Join us at H.T. Parekh Auditorium at Ahmedabad Management Association : Authentic Information on 24 February at 5 pm. 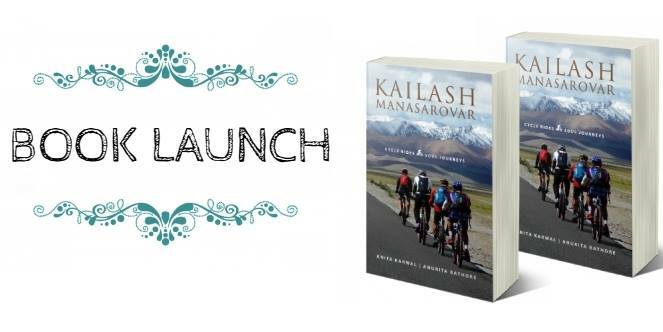 to meet the authors and engage in a discussion around the book, the journey and a lot more. Come savour the ‘high life’ to Lord Shiva’s abode, on wheels! Anita likes to describe herself as ‘an officer and a gentle mom’. She is a bureaucrat and belongs to the Indian Administrative Service. Her favourite pastimes include reading, indulging her husband and kids, lording over the TV remote for watching sundry films and serials and laughing at her own follies through the medium of columns that she has been writing for some English dailies. She has co-authored two books with Atul, her husband: Think Everest (2010) and Everest- Same Path, Different Peak (2016). Anurita began her journey in journalism at 21 with The Indian Express and left day-to-day writing at Times of India’s Ahmedabad Mirror after close to two illustrious decades. Some special features for India Today as well as exclusive interviews with celebrities for the web later, she took up offers to teach school and college students the fine art of writing and editing. An aesthete, Anurita enjoys listening to tales and experiences. She curates and infuses life in narratives and believes stories must be told.